Why detoxify and what is a detox foot bath are excellent questions? 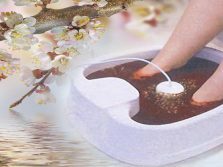 The detox foot bath is a process that allows the cells all over your body to release their toxins. The equipment then removes the toxins from your body to collect at your feet. Why detoxify? This process is necessary because you can be exposed to toxins that your body is not effective at removing as early as while you are still in your mother’s womb. Each year that you live, you accumulate more and more of these toxins. Eventually they can begin to rob you of your energy and health. Always feel tired. Cause your energy level to soar! Have extreme muscle pain. Eliminate your pain completely. Have severe memory problems. Help you to focus and remember better. Have heavy painful legs and feet. Cause your feet and legs to feel lighter. Struggle to breathe. Breathe freely. Processes such as biomonitoring have shown that nearly everyone is carrying a serious toxic load. There have been many documented studies that document just how toxic our bodies have become! Look a the hair analysis results below. 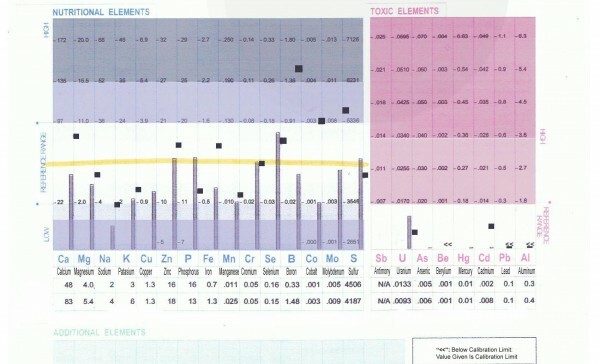 The blue area indicates that there are 7 nutrients that are too high (above the yellow line). Of special note is the Mo (Molybdenum) as it was causing problems that lead to the person turning yellow (jaundice) and being diagnosed by a physician with Gilbert’s Syndrome. 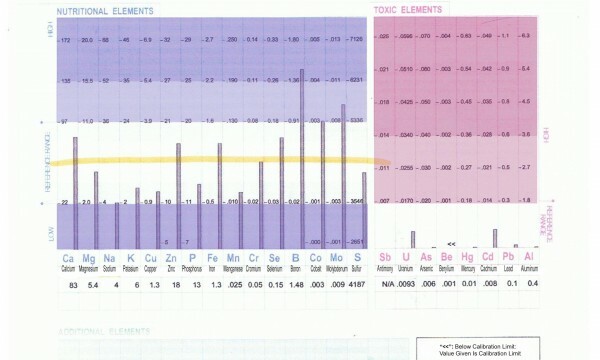 The pink area indicates 7 toxic metals present. The mercury and lead combined can cause a person to feel extremely tired and unable to walk across a room due to fatigue. The results of this hair analysis account for all of the person’s health issues. In the table below the little squares represent the values of the hair analysis above. After detoxing for some time, notice that all but two of the nutrients in the blue area are in the normal range (under the yellow line). Even the Mo (molybdenum) is now normal. As expected with a normal molybdenum level, the person does not turn yellow anymore making the diagnosis of Gilbert’s Syndrome inapplicable. In the pink area, notice that nearly all of the toxic substances are nearly gone. The U (uranium) has increased. This means that the person’s body has begun releasing the uranium from the cells that have been hiding it. Since these cells are actively dumping uranium into the bloodstream faster than it is being removed by the Aqua Detox Equipment, more uranium is showing up in the hair. This value will also drop with time. How do you get your optimum health status back? TOTAL BODY DETOXIFICATION USING A DETOX FOOT BATH!